‘Gleeve’, actually my death knight Gleave from live, is the most recent of my transfers to the PTR I trained him up in Unholy and Frost specs. I found that even against Howling Fjord baddies, the frost spec seemed weak. I died in no time flat which was a turn-off. When I switched to unholy, I was fine. Why? I ‘m not sure.It may have had something to do with my lack of dual-wielding weapons (frost’s specialty) but more importantly I was hardly getting any healing from Death Strike. Of course, that didn’t change from frost to unholy, so credit my ghoul as well. Dark Transformation was fun too, but hard to track for me. I had to select my ghoul to see how many stacks he had which was a pain. 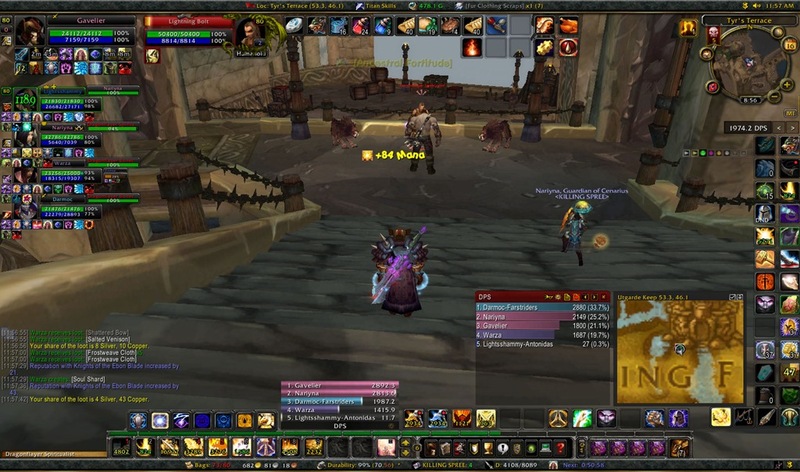 The net result of my testing on the PTR is five good spec changes (ret and prot for pallys, demonology warlocks, beast master hunters and unholy death knights) and one not so good one (frost DKs). The testing continues! Well, I’ve been playing on-and-off again, and gotten Gleave to level 70. Here is in the Temple City of En’Kilah. Or whatever that icy dead-filled fortress is in north east Borean Tundra. He’s on his way to 71 now, and is doing pretty well so far. Gav’s on ice at the moment. I just don’t have the drive to keep running dailies and whatnot with him all of the time. 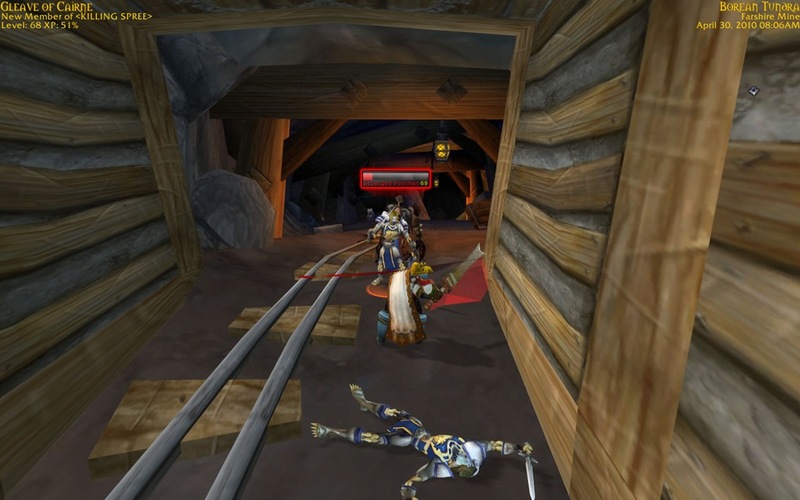 Sorry I’ve not been around, but I’ve been busy leveling Gleave, my Death Knight to reach Northrend. He hit level 68 the other morning in Area 52 in the Netherstorm. He promptly went to Ebon Hold to train and then to Stormwind Harbor. 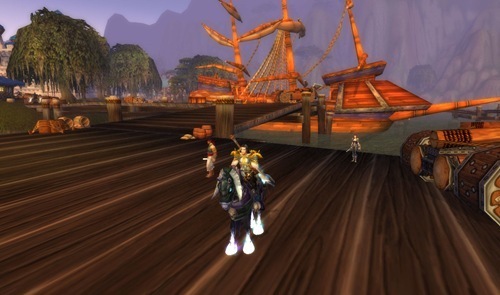 There, he boarded a boat with two other players en route to Northrend for the first time. We acknowledged each other and promptly went to the flight master at Valiance Keep in Borean Tundra - always the first stop in a new zone, right? Now I’ve got two toons in Northrend! Gav is going to bum some gold off of Gleave (who surprisingly has more then Gav) to buy Gleave a book as a welcoming gift. Welcome to the frozen north, Gleave. This is just a quick update on current events. Gav ran two random heroics yesterday with some guildies, the first one (Utgarde Keep) with two guildies and the second one (The Nexus) with three. The random healer in our second group had to feel left out. In any case, we cleared both in no time, and I never died. I got some disenchanted gear’s regents, which I promptly put on the auction block. 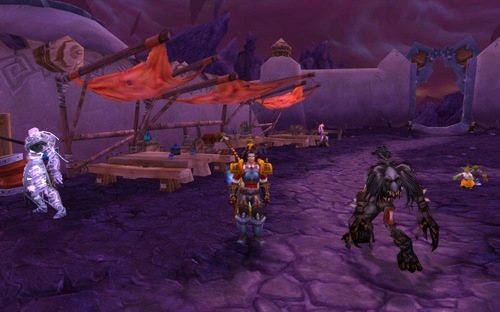 On another note, I went and bought the XP-bonus shoulders for Gleave, my death knight. 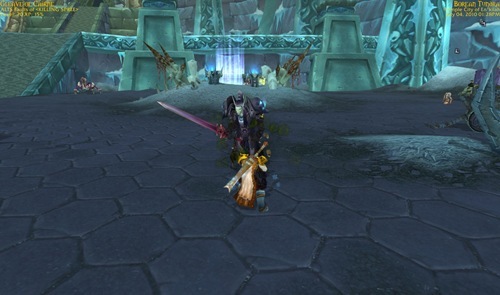 With a gryphon and XP shoulders, he’s about as happy at 63 as a death knight can be. D’you remember when I was whining yesterday about not seeing any other Death Knights and how I was going to die facing Patchwerk? Well, I logged in today, expecting to die trying to kill him when I ran into a dwarven DK named Hellknowsme who I ended up teaming up with. The dude was pretty darn good and we slayed Patchwerk together. Thank goodness he was there! I was going to try and solo Patchy but after it took us several minutes to finish him, I realized I’d never have been able to do it alone. Thanks, Hellknowsme, I owe you one. I picked up WotLK recently (as written HERE), so here’s my experience. Gleave is my human Death Knight, who recently finished off the battle at Light’s Hope Chapel, leaving the Litch King’s grasp. Now I’m supposed to kill Patches (bringing back bad memories from my battles with Stitches), and the questgiver said to have my ‘fellow Death Knights’ help me, because Patches is too much for me. Um, dude? I’m alone here. There’s NO ONE ELSE AROUND! I’ve not seen another non-NPC DK since logging in, so I’m not sure where I’m supposed to get this help from. 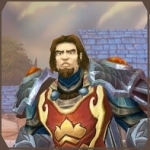 Gavelier, after extensive questing in Winterfall and running a few errands, got within spitting distance of lvl 58, and after killing some random mobs in the Eastern Plaguelands I finally dinged, qualifying for the Outlands. I was joyous; after almost 200 hours of playtime, I was finally ready to see what the Burning Crusade expansion had to offer. However, then I remembered that after just an hour or two of play, Gleave was also level 58. This was unfair, but it brings me to my next point. While I appreciate not having to start from square one with my DK, I did notice that there’s a serious lack of connection when you start so deep in the game. Gav’s my favorite because I’ve been through so much with him. From slaughtering Defias bandits in Westfall to my eventful first trip into Un’Goro Crater, Gav and I have experienced most everything for the first time together. Gleave, on the other hand, just kind of exists. I have no connection with him, and could delete him tomorrow with little remorse. Getting a ton of nice gear and abilities right from the start made him seem like someone else’s character that I was just borrowing. Maybe I’ll warm up to him, but for right now, he’s not my favorite.